Born on February 21, 1910, in St. John's Wood Douglas would have a troubled school life, where he much preferred sports to academia. He was a first-class cricketer, but preferred rugby at which he excelled. So-much-so he had a trial for the Harlequins. Fortunately for him, some of his teachers saw his potential and, with their help, he began to excel at his studies. Eventually he was offered a place at Oxford University, but turned it down as he preferred Cambridge. At 18 years old Bader entered the Royal Air Force as an officer cadet and, after less than 12 hours of flight time, took his first solo flight, on February 19, 1921. In 1930 Bader was commissioned as a pilot officer and became a bit of a daredevil, performing acrobatics and stunts, many of which were against regulations. On December 14, 1931, on accepting a dare, Bader attempted some acrobatics with devastating consequences. As he performed a low altitude roll a wingtip caught the ground, cartwheeling the aircraft, pinning Bader inside. Rushed to hospital the surgeon was forced to remove both of Bader's legs, one of above and one below the knee. In June 1932, after nearly 18 months of convalescence, during which time he had received a pair of new tin legs, Bader had the opportunity to take to skies again, flying an Avro 504. However, in 1933, his flight status was revoked, as his situation was not covered in King's Regulations. Bader finally managed to get a medical categorisation for operational flying, at the end of November 1939, thanks in part to the outbreak of World War II. The first thing he did on his solo flight was to fly upside down at 600 ft.
By February and May 1940 Bader was made section leader, then flight officer and then flight lieutenant of 222 Squadron. A month later became acting squadron leader of 242 Squadron. In March 1941 Bader became acting wing commander of 145, 610 and 616 Squadrons. On August 9, 1941, Bader was shot down over Saint-Omer, France, which happened to be where his father had died almost two decades earlier. Reports into the downing of his aircraft were mixed: Bader himself believed that he had collided with a BF 109, while some reports stated that he had been shot down by a BF 109. The most likely explanation, though, is that he was shot down by a Spitfire from 616 Squadron, in a case of friendly fire. After escaping from a number of POW camps, Bader was finally sent to Colditz, where he remained until the end of the war. On July 1, 1945, Bader was given the honour of leading a flypast of 300 aircraft over London. He continued in the RAF until July 1946, when he retired with the rank of group captain. 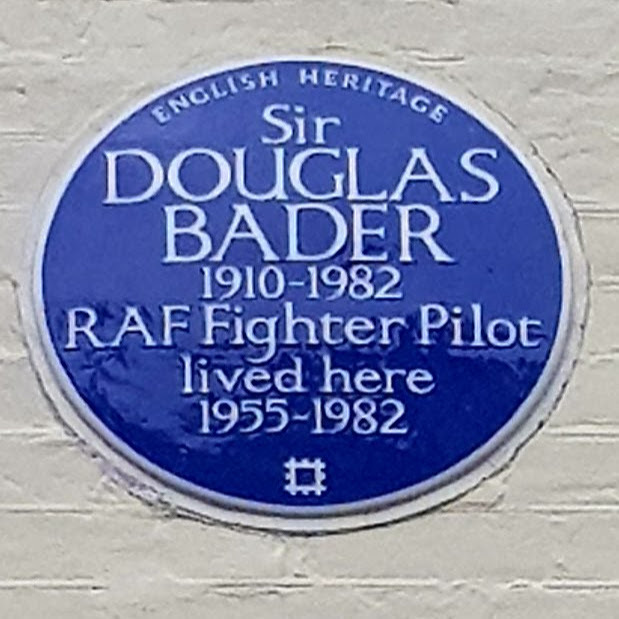 Douglas Bader was a man who defied adversity and personal tragedy to become a leader of men and a hero to a generation.